What is the cheapest way to get from Catania Airport (CTA) to Taormina Mare? The cheapest way to get from Catania Airport (CTA) to Taormina Mare is to bus which costs 5€ - 9€ and takes 1h 46m. What is the fastest way to get from Catania Airport (CTA) to Taormina Mare? The quickest way to get from Catania Airport (CTA) to Taormina Mare is to taxi which costs 85€ - 110€ and takes 39m. Is there a direct bus between Catania Airport (CTA) and Taormina Mare? Yes, there is a direct bus departing from Catania Airport and arriving at Taormina Bus Terminal. Services depart hourly, and operate every day. The journey takes approximately 1h 25m. How far is it from Catania Airport (CTA) to Taormina Mare? The distance between Catania Airport (CTA) and Taormina Mare is 48 km. The road distance is 55.5 km. How do I travel from Catania Airport (CTA) to Taormina Mare without a car? The best way to get from Catania Airport (CTA) to Taormina Mare without a car is to bus which takes 1h 46m and costs 5€ - 9€. How long does it take to get from Catania Airport (CTA) to Taormina Mare? The bus from Catania Airport to Taormina Bus Terminal takes 1h 25m including transfers and departs hourly. Where do I catch the Catania Airport (CTA) to Taormina Mare bus from? Catania Airport (CTA) to Taormina Mare bus services, operated by Interbus, depart from Catania Airport station. Where does the Catania Airport (CTA) to Taormina Mare bus arrive? 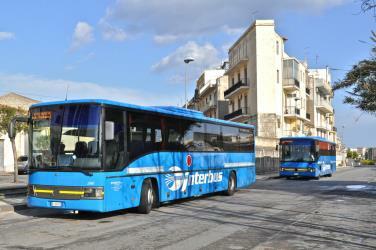 Catania Airport (CTA) to Taormina Mare bus services, operated by Interbus, arrive at Taormina Bus Terminal station. Can I drive from Catania Airport (CTA) to Taormina Mare? Yes, the driving distance between Catania Airport (CTA) to Taormina Mare is 55 km. It takes approximately 39m to drive from Catania Airport (CTA) to Taormina Mare. Where can I stay near Taormina Mare? There are 2752+ hotels available in Taormina Mare. Prices start at 46€ per night. What companies run services between Catania Airport (CTA), Italy and Taormina Mare, Italy? 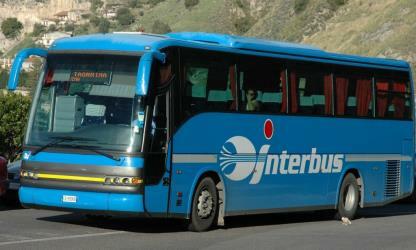 Interbus operates a bus from Catania Airport (CTA) to Taormina Mare hourly. Tickets cost 5€ - 9€ and the journey takes 1h 25m. Discover how to get to attractions and hotels near Taormina. Isola Bella (Sicilian: Ìsula Bedda) is a small island near Taormina, Sicily, southern Italy. Also known as The Pearl of the Ionian Sea, it is located within a small bay on the Ionian Sea; it was a private property owned by Florence Trevelyan until 1990, when it was bought by the Region of Sicily, being turned into a nature reserve, administrated by the Italian branch of the World Wide Fund for Nature. There is a narrow path that often connects the island to the mainland beach. The island has a small and rather rocky beach which is a popular destination for sunbathers. The Ancient theatre of Taormina ("Teatro antico di Taormina" in italian language) is an ancient Greek theatre, in Taormina, southern Italy, built in the third century BC. Palazzo Corvaia (sometimes spelt Palazzo Corvaja) is a medieval palace in Taormina, Sicily, Italy, dating from the 10th century. It was principally built at the end of the 14th century and is named after one of the oldest and most famous families of Taormina which owned it from 1538 to 1945. Francavilla di Sicilia (Sicilian: Francavigghia) is a town and comune in the Metropolitan City of Messina on the island of Sicily, southern Italy. Rome2rio makes travelling from Catania Airport (CTA) to Taormina Mare easy. Rome2rio is a door-to-door travel information and booking engine, helping you get to and from any location in the world. Find all the transport options for your trip from Catania Airport (CTA) to Taormina Mare right here. Rome2rio displays up to date schedules, route maps, journey times and estimated fares from relevant transport operators, ensuring you can make an informed decision about which option will suit you best. Rome2rio also offers online bookings for selected operators, making reservations easy and straightforward.